Monitoring of Cole Crop components under Farmers’ FIRST Project. Cole crops cultivation is one of the major components under Farmers’ FIRST Project. A technology on cultivation of these vegetables such as nursery management, line sowing, spacing, transplanting, mulching and maturity indices were demonstrated. In addition, seeds were distributed for adoption of demonstrated technology. A field visit and observation was taken from time to time for supervision of farmers’ activities as demonstrated. Monitoring was conducted to assess the progress of cole crops cultivation the project. Seed was sown in line at 5 cm distance between rows as demonstrated. Seedlings were protected using banana pseudostem. The banana pseudostem was cut into 30 cm length and split into halves. Each layer was erected immediately after transplanting at an inclined (∟450) to protect from evening sunshine (Fig 1). 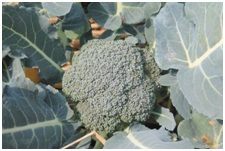 Broccoli needs sufficient moisture in the soil for uniform and continuous growth of plants. Therefore, frequent irrigation at 10–15 days is given depending upon weather conditions. 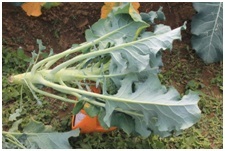 The dry conditions adversely affect the quality and yield of shoots by being more fibrous. On 5the other hand waterlogging condition depresses plant growth. Generally furrow system of irrigation is practiced (Fig 3). A 4-5 cm thickness of mulching was adopted by farmers for moisture conservation. Mulching materials used are paddy straw and dry grasses (Fig 4). Heads are harvested when green, compact bud clusters and 12-15 cm diameter (Fig 5). Harvested with a sharp knife along with 10-15 cm stems (Fig 6).